Just outside of Honor, this cottage is close to everything. Within a few minutes drive is the village of Honor, where you can get everything you'll need for a week of adventures and relaxation. Spend an evening taking in a double feature at the Cherry Bowl Drive In Theater, one of only a few drive in theaters left in the state, always showing family friendly new releases. The Sleeping Bear Dunes, wineries, and small town shopping are close at hand! This cottage is available off weekends during the off season! 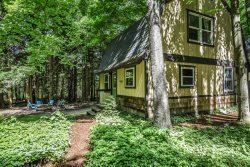 This one story cottage offers an open floor plan making it easy to spend quality time with your family. The kitchen is open to the shared dining and living room. The two bedrooms provide sleeping for six with additional sleeping for two on the sofa bed in the living room. Large windows on the waterside of the cottage give you great views of the lake. Danielle and Angi have gone above and beyond for our family. We have a severely special-needs son and they have done everything to make our vacation perfect. The cottages that we stay at are easily accessible for a wheelchair and if they aren't, they purchased a ramp to make it accessible for us! Can't say enough about how caring and concerned they are about our vacation and how genuinely nice they both are. The property was beautiful. We had everything we needed and those special creature comforts that I wanted (dishwasher, washer and dryer)! Can't wait till next year! I enjoy working with Danielle. She is always friendly and helpful. Had a great week with great weather. The team is always very helpful in getting our vacation set up. We had an amazing week, as always. Can't wait to be back next year!